It started in October first week with a message from Abhay saying he is planning to take a small group to Thattekad for birding. The location was always on my agenda (along with Dandeli and Bharatpur that I am yet to travel to) so I was more than willing. By the time the plan was finalized in mid October there were a few changes, initial 2 night plan got changed to 3 nights (logistics, areas to cover, etc. ), some members from the tour dropped and finally it was 4 of us (Abhay plus 3 participants). Within those 2 weeks even the flight charges had increased drastically, and we ended up booking the late night flights. By now, I have been making at least 2 trips a month so bags are more-or-less packed quickly. This trip being with Abhay Kewat, tripod is mandatory. He always insists on a good quality tripod (and always cribs about our tripods not being up to the mark). And being December, we packed an extra jacket as well. The action started just before mid-night, when I started from Thane. Flight was at ghastly hours (2 am) so not much of sleep. Jet flight reached on time in Cochin. 2 of us from Mumbai and 2 from Pune. Like every trip, there were 2 members who were not officially there (They had some urgent work at home and hence were on leave.. at least that was their published stand). So Mr. S was with me from Mumbai and Mr. P from Pune with Abhay. (My fellow Photography friends, please don’t try to guess the actual names because that will be too easy for you ). Reached Cochin by 4:30am, we had time as the Pune flight was yet to reach. Best (or worst) part is my bags were first on the baggage-belt (when we are in hurry to go back home, the bags invariably test your patience and here when I had all the time, my bag was the first to arrive). Anyway, within next half hour we had started our journey towards Thattekad. Bibin was our driver (for first 2 days of the trip). He dropped us to our destination by 6:45.. a quick welcome-tea followed and before we even thought of having a small nap (considering that we had hardly slept in the night, it was overdue), Abhay announced “we will be starting in 15 minutes, so freshen-up get your gear ready quickly”. The first trail was to a jungle nearby (about 15 minute drive), picked our birding guide (Sanu) on the way. He took us to a patch of rocks little higher up from the ground and there were trees all-around. We planted our tripods on a relatively flat surface with keeping the Sun behind us. One specific tree attracted our attention because of the bird activity there. We quickly spotted a flock of Minivets, Sunbirds, and the Flowepeckers. 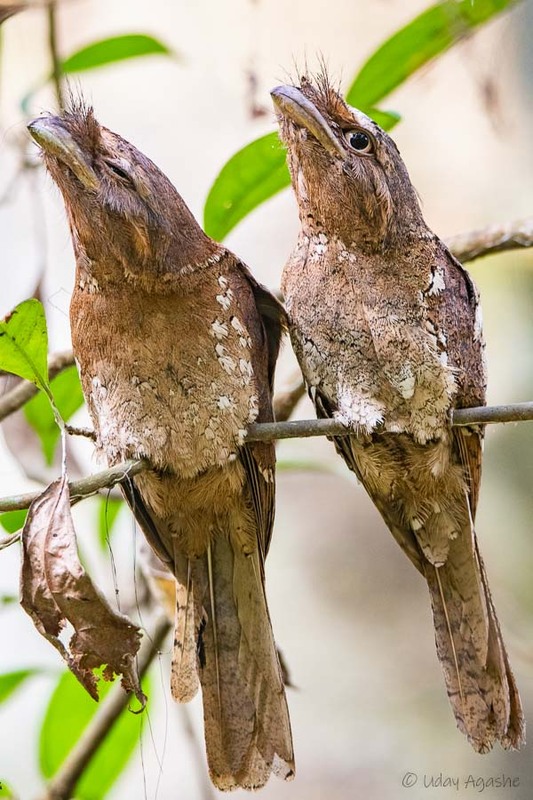 They were happily blabbering along without being overly disturbed by our presence (not entirely true, their activity did spread to near-by trees with our approach). 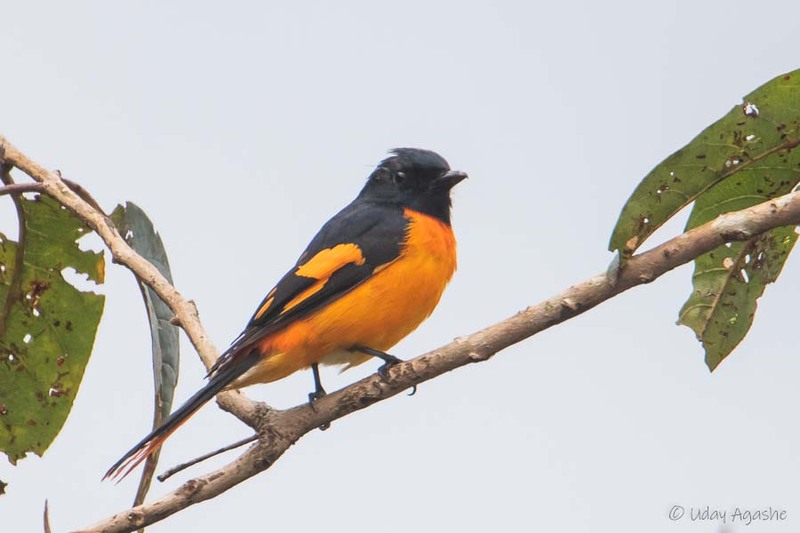 Very soon we could catch the flame-throated bulbuls and the golden-fronted leaf-bird. 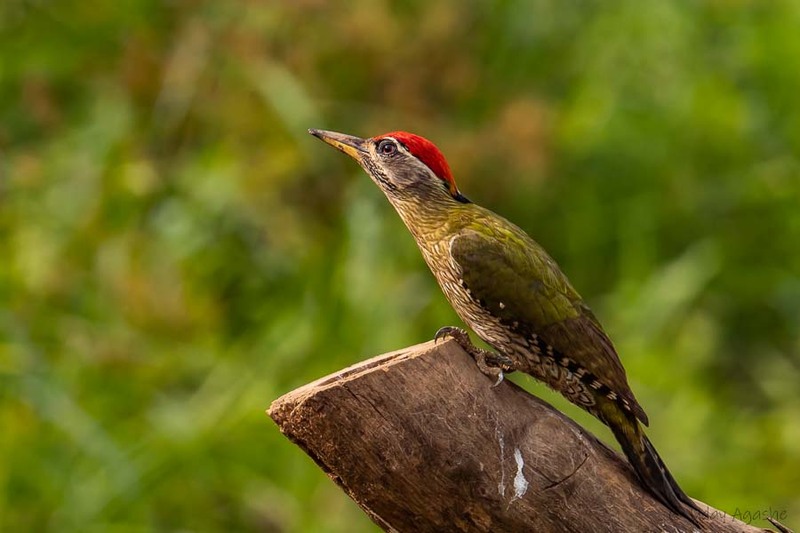 Even the pigmy-woodpecker marked its attendance briefly. Our morning was suddenly becoming interesting as the bird activity ballooned. All the tiredness ran away quickly. The atmosphere was such that, we kept our cameras aside and just enjoyed the avian activity around us. But before birders, we were all photographers and soon that instinct took over anyway. Light wasn’t that good plus the birds were under canopies making photography that much more difficult. 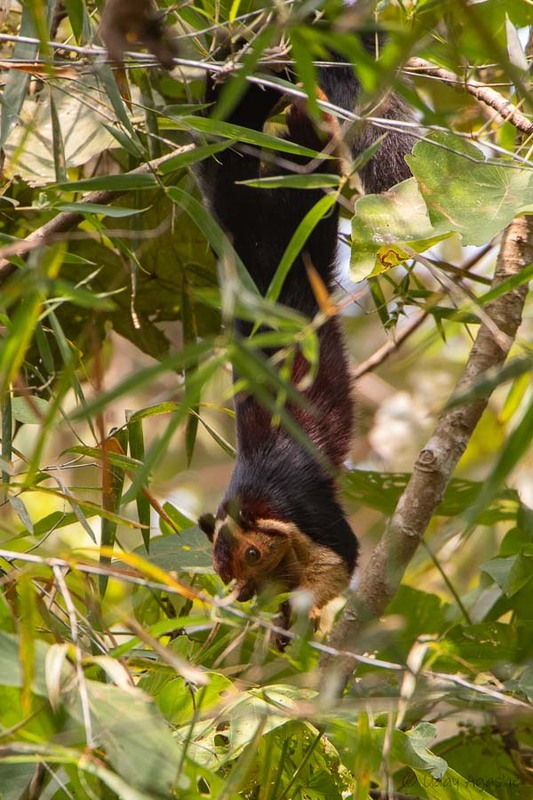 2-3 Hill Mynas and a lone Giant Squirrel (शेकरू in Marathi) were also seen nearby. But the star attraction for the morning was the small little “Dollar bird” perched atop a high-tree basking in the morning Sun. 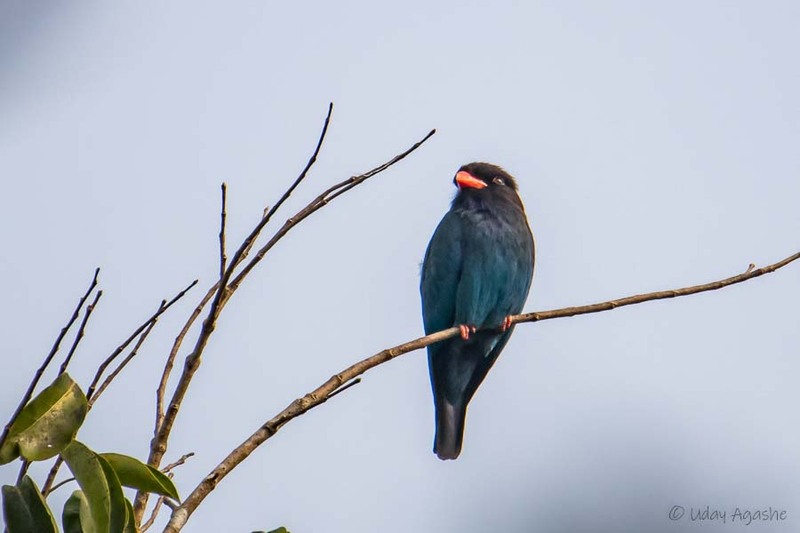 We continued there till about 9:30am and additionally saw Malabar Barbet, Fairy Bluebirds, Malabar Shrike and few other small birds. Sanu then took us thru a small jungle trail (not for birds but just to reach a spot from where we can get back into our vehicle), on the way we saw signs of fresh Elephant activity (possibly in the night) and also some leopard droppings. By about 10am, we were at another near-by spot. 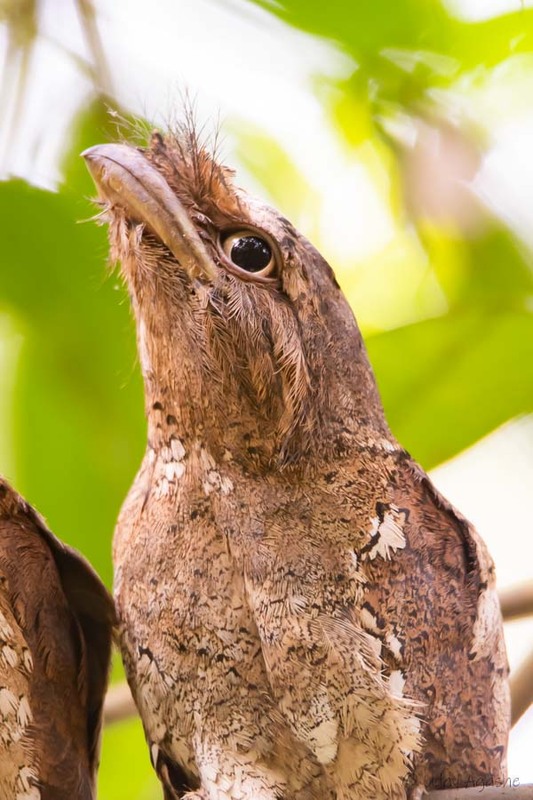 Our guide had knowledge about a pair of SriLanka Frogmouths in that vicinity. He asked us to wait near the entry point and went swiftly into the jungle. Within 10 minutes he came out all excited and told not to make any sound while walking and just follow-him. 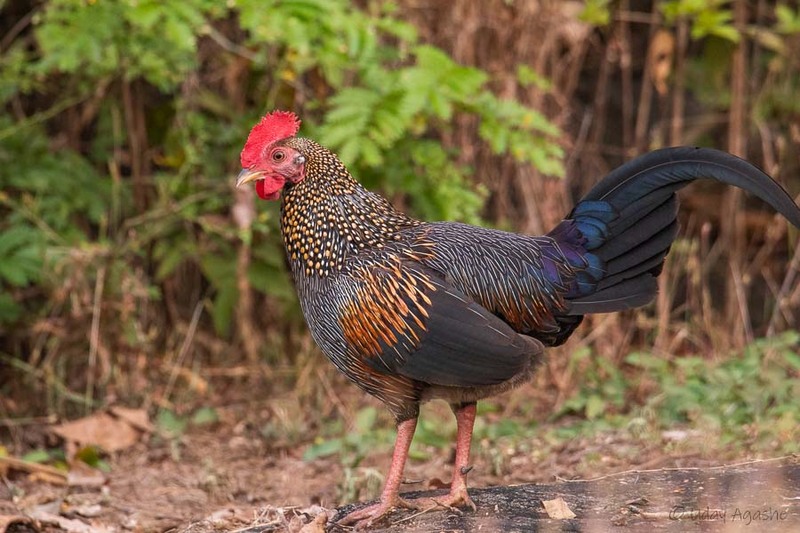 He had sighted the pair and it was perched at a right height for us to take photos. For those who have been thru it already know that walking in the jungle without making any noise is just impossible. There are dry leaves fallen everywhere and a meagre touch of your shoe will result in a loud crack. But we marched thru anyway, to an amazing view of this pair, rock steady in their position on the tree. Initially we took photos from far but gradually approach it to as close as about 8-10 feet, we took turns to take photos so as not to crowd around near the birds. Our hunger then took over and we quickly headed-back to our rooms for breakfast. We all relished the local dishes prepared by our home-stay hosts. It was nearing mid-day and we had plan for another jungle-trail before we break for lunch (planned at 3pm). Mr. P decided not to join as he was already feeling tired (But hats-off to him actually… considering his medical record coming up all the way here itself was a challenge). Sanu then took us to another patch of Jungle and our walk continued. Every few minutes, we would break into the deep jungle asking us to wait; he would then call us if he found anything interesting. Within next half hour, we had 2 more lifers. The “Brown Wood Owl” and “Brown Hawk Owl”. On both occasions Sanu had cautioned us not to have any eye contact with the Owls and walk as discretely as possible. It took us some time to adjust to the available light and then locate where exactly the owl is perched. It all looks very easy to talk about but carrying our tripods and heavy lenses thru that jungle isn’t a very easy task (on top of that the guide constantly reminding us not to make any noise). We somehow managed to click record shots on both occasions but frankly watching them in their natural environment was itself a bid experience. 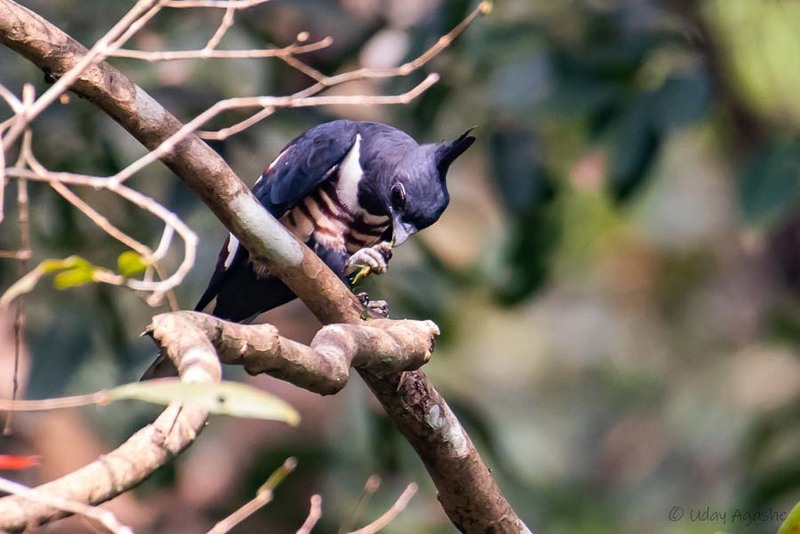 It was about 1 pm by then and Sanu had plans to show us another lifer, the “Black Baza”. Next 2 hours were a journey thru the jungle, streams, and what not. Tiring, at times frustrating but we tried to keep with Sanu. He was just too quick for us actually (except maybe for Abhay). The moment he could see the bird or hear the call, he would just dash in the direction without bothering the tree branches coming his way. And he kept on hounding us to follow him quickly (but without making any undue noise). The elusive Baza kept giving us glances but never remained in one position for long. Soon we realized there were more than 1 individuals in that part of jungle. We got a few record shots on the way every now and then but nothing to satisfy the photographers within. By 3pm, finally Mr. S gave up and asked us to stop the pursuit. Even I was tired but the urge for a good photo kept me from saying it. Anyway, we decided collectively to return back for lunch. We reached rooms by 3:15 and hogged the food immediately. As usual, Abhay was still energetic and he had already planned for a night trail. Our local guide was confident about showing us the Great-eared Nightjar and possibly a mammal (Slender Loris). We started at 7:30pm (it was dark before 7pm itself). Guide had asked us to carry good torches which unfortunately we didn’t have. Within 10 minutes, the driver dropped us somewhere on the road (I could not make out any noticeable landmark there) and we quickly took a pathway into the deep jungle. Except for our torch-lights, it was pitch dark. Guide had already warned us about wearing good shoes as the jungle was likely to have many snakes. He instructed us to use our torches only to see the path below, no light should pass towards the surrounding trees (as he was searching that area for bird/mammal eyes). 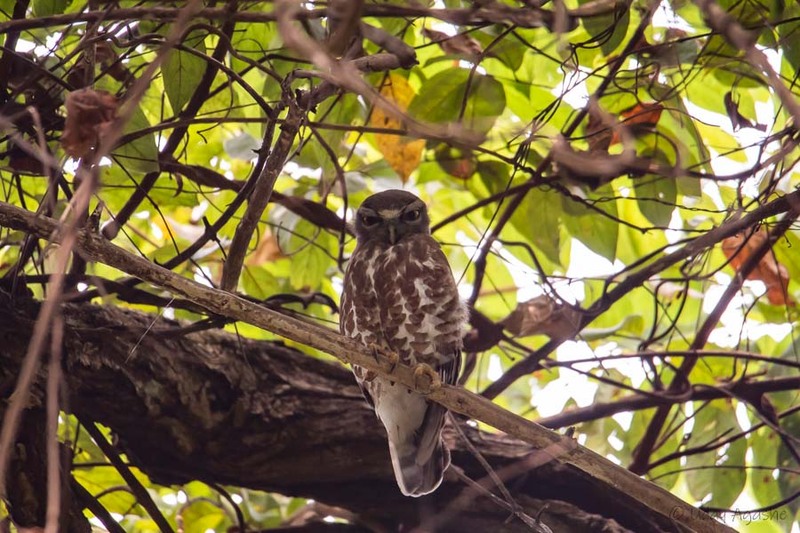 Within about a hundred feet, the guide made us alert about an owl call, it was the Sri Lanka Bay Owl. We could only hear the sounds but could not see it. 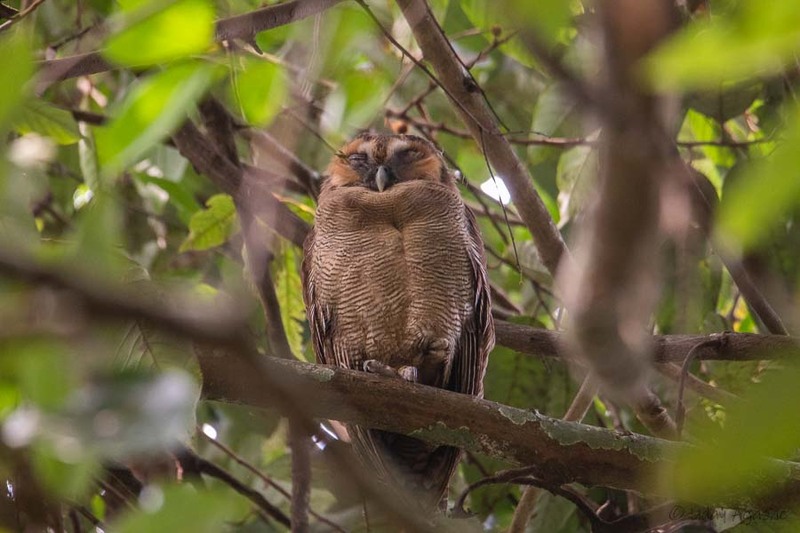 Soon after, the guide frantically pointed his torch at a high tree-top and whispered to get the cameras, he was pointing at the Spot-bellied Eagle Owl. It was really a large bird of prey but our torch light wasn’t sufficient to take any meaningful photo of it. And it was there for a few seconds only; its flight was awesome to watch though. 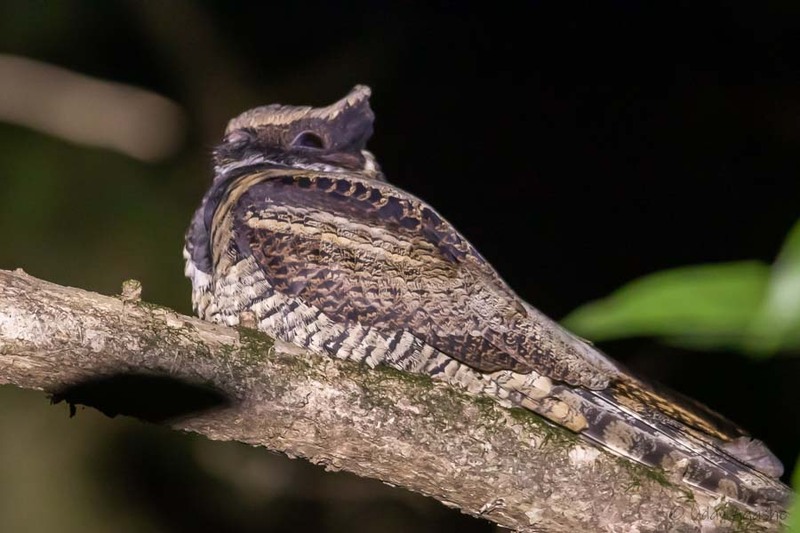 Our night walk continued further, little further Sanu alerted us about the “Great-eared Nightjar” seating on open-perch. Here we could get some pictures (with very high ISO), luckily there was another group of birdwatchers passing by (so we were not alone in that dark jungle) and one of them lend their powerful torch, with help of which we got some decent photos. 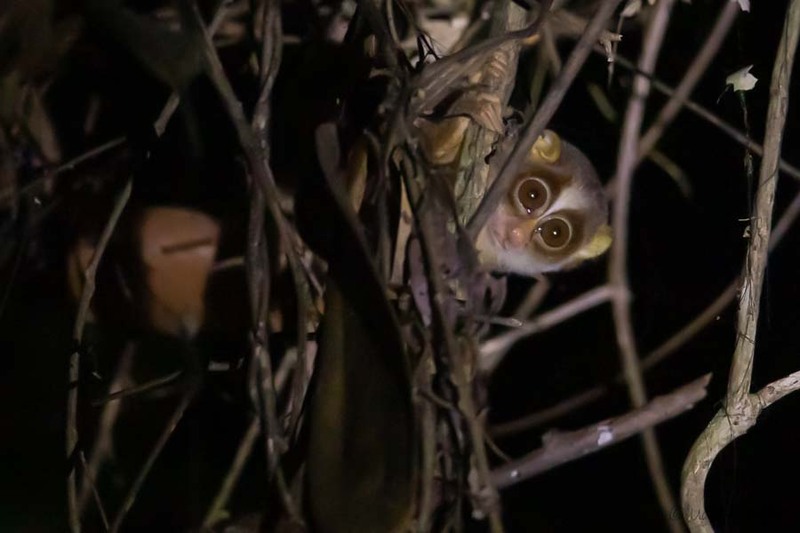 With one target done, Sanu was sure to find the “Slender Loris”. He intensified the search going little dipper every now and then and calling us to come quickly. If we thought the afternoon jungle walk was risky, the night was shear reckless… we were frantically running behind our guide and Abhay, deep into the jungle thru the branches and leaves knowing fully well that the forest floor can very well have the serpent population. 2-3 times we came very close to the Loris but before we could dare our cameras out, it vanished. But we persisted on. At last, after some more steps thru the thick branches/bushes, we managed to see it in the torch light. And took some quick photos. We then requested Sanu to stop the further search as we were happy to just see it, getting photo was bonus. All-in-all, standing inside the deep jungle with no light (at times, he had asked us to switch off all torches) was a thrilling (and frightening too) experience. Back to room, we had quick dinner and slept off like logs (with alarms for 6am wake-up). We were ready by 7am for another jungle trail. Our guide informed that there was a state-wide strike that day which meant we could not go very far from our home-stay. We had to roam-around in the nearby jungles only. 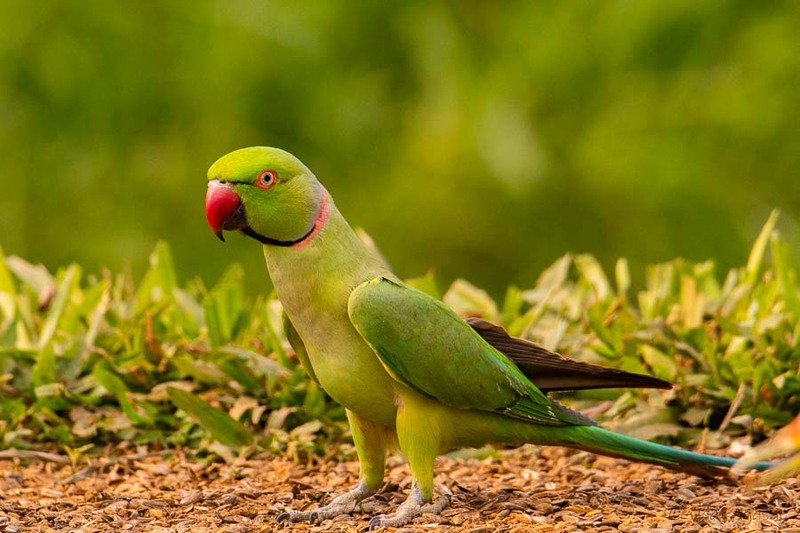 Since we were staying close to the Salim Ali sanctuary, we could go there in the afternoon. For morning, we chose another nearby area, not far from villages but the path was lined with tall trees on both sides. This time we did not have any target species to look. 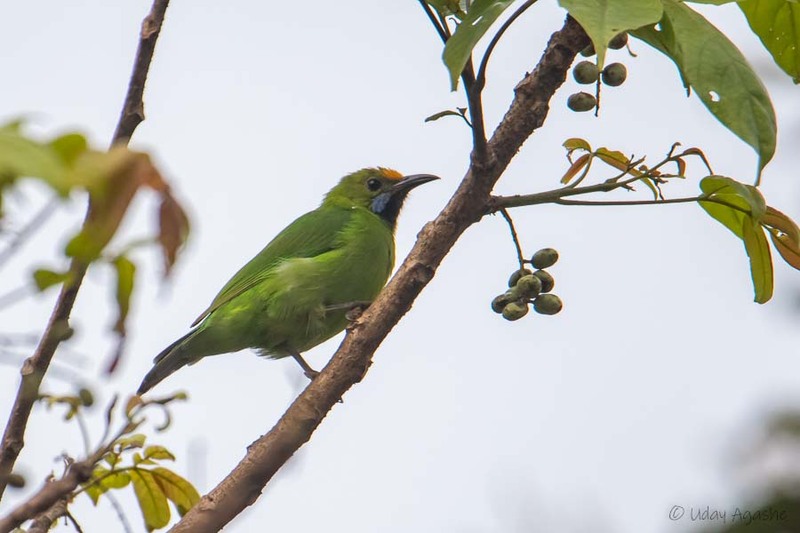 During those couple of hours we could see the “Green Imperial Pigeon”, “Heart Spotted Woodpecker”, “Plum headed Parakeets”, “Hair-crested Drongo”, “Flame-throated bulbul” and some others. 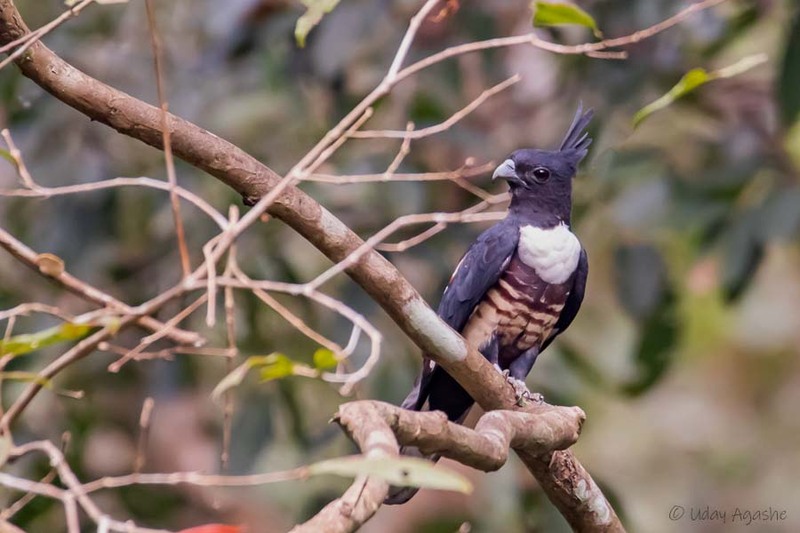 We once again had a glimpse of the “Black Baza”, also got its flight photo from some distance. We were back for breakfast by 10:15 and by 11am, we were out again for the Bird Sanctuary. This walk was relatively action-less as there wasn’t much bird activity in the sanctuary that time (maybe the birds were on strike too). 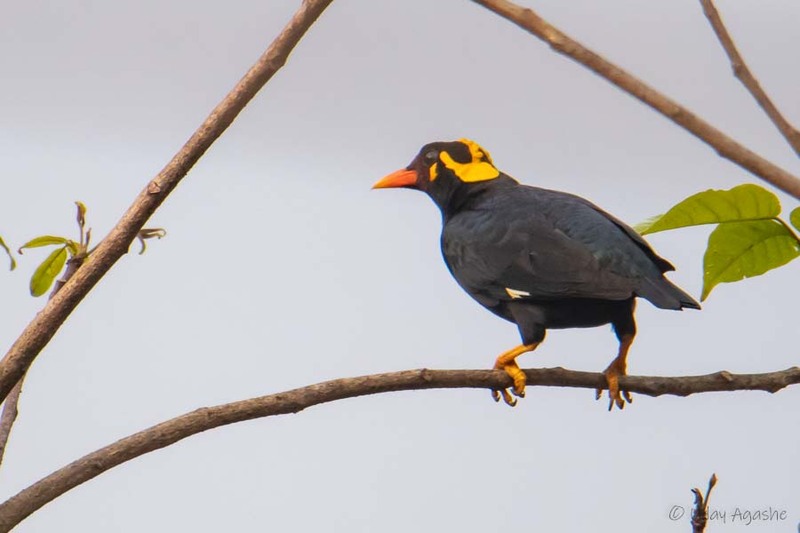 But the silver lining was another lifer in the form of “Black-naped Oriole”. After lunch, we thought of doing some less-effort birding, that is not having walking trails. Our guide took us near a river front near his own house. 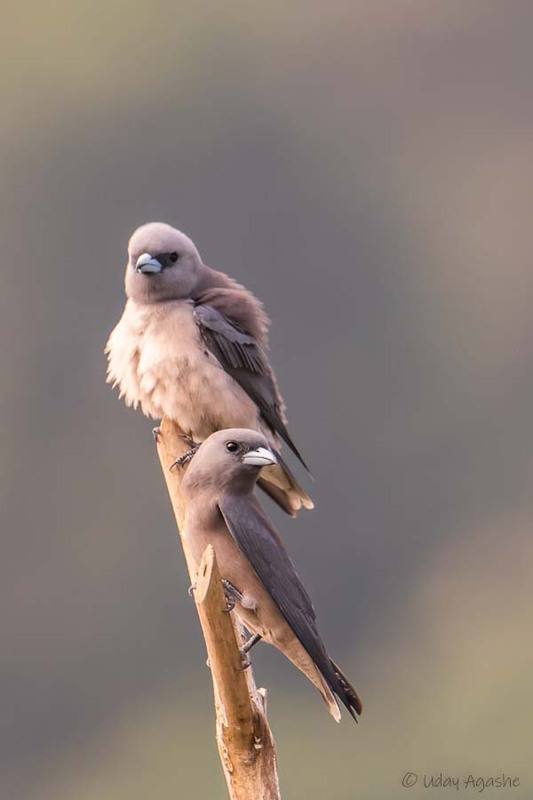 He told us that the area is frequented by the Ashy Woodswallow, which was a lifer for some of us. Little walk from the main road into the fields and we were on the river bank. We then located a small tree under which there was some shade and made ourselves comfortable on the grass. 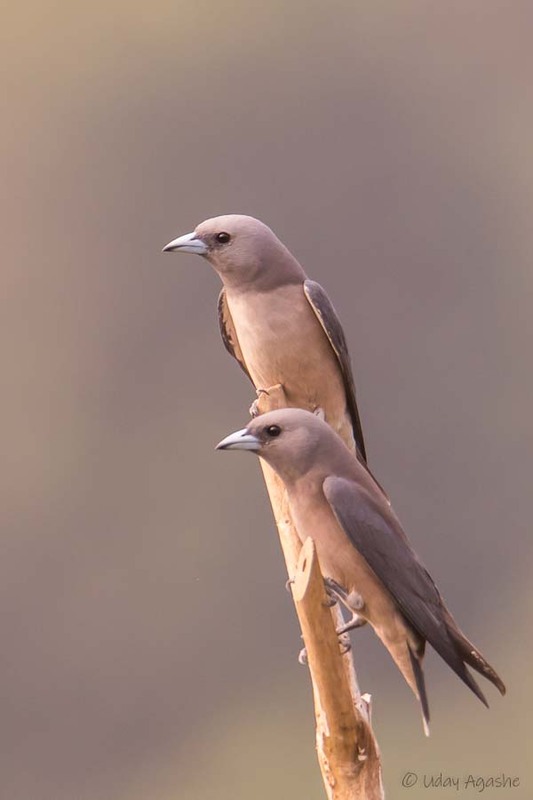 We spent next couple of hours there, watched the activity of the woodswallows as well as few other birds like green bee-eater, pied kingfisher and the red-rumped swallows. Closed our session little early and were back in rooms by 5pm. We decided to check-out from this place and then move to another place (with the famous “K V Eldhose” of Thattekad). For next 2 days we planned to do only the hide based birding (where you remain at one place and wait for the birds to come for feed/water), which is more relaxed on legs and shoulders (carrying the heavy load of camera and tripod). Eldhose’s vehicle came to pick us up at about 7pm and by 7:30 we were at our resort, this looked a nice cozy place on the edge of the jungle, the rooms were made up of wood and were nice and comfortable. The dinner preparation that day was more like standard hotel food but we requested them to make us local Keralaite dishes during our stay and they agreed to it readily. After dinner we got into casual discussions, it became very interesting when Abhay came out with his jungle adventures (and misadventures too) and it went on till mid-night. Our day was to begin at 6:30 am and we were all set, waiting for the pick-up vehicle. There was another group of 5 people from Bengaluru who would be with us. We started by 6:45 and reached Eldhose’s place by 7 expecting him to take us to the hide. But as we saw, he had just lined up chairs in front of his house itself and was waiting for the daylight to break. On enquiry, we realized that before the hide, the show was being setup for the Malabar Grey Hornbills. We took our chairs and kept the cameras ready on the tripod. 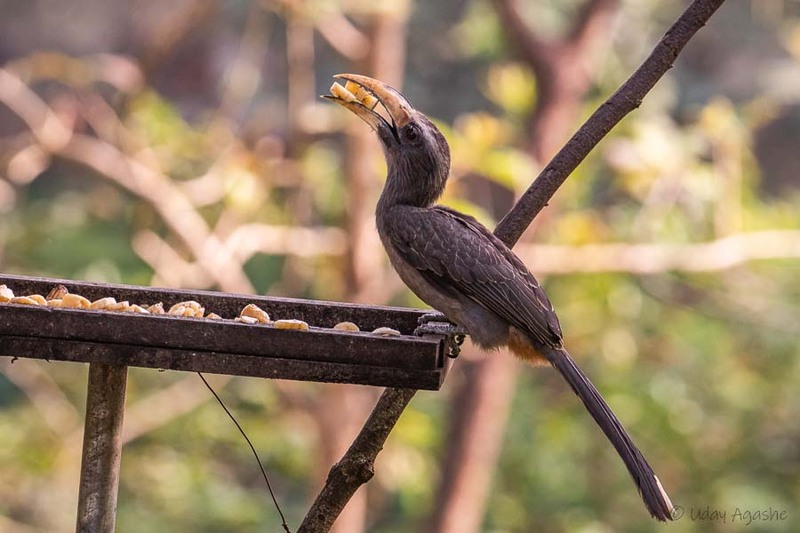 As soon as Eldhose kept the banana pieces in tray, the hornbills started coming in. And the camera clicks followed. The show was over even before we realized it, frankly I was little disappointed to start with. Then he announced us to go to the nearby hide (2 minute walk from his place). There were about 20 people near his house that time, luckily all 4 of us hurried through and got our seats inside the hide. We then realized that the others had to do the photography standing next to the hide (they had created a partition with some open areas for people standing). 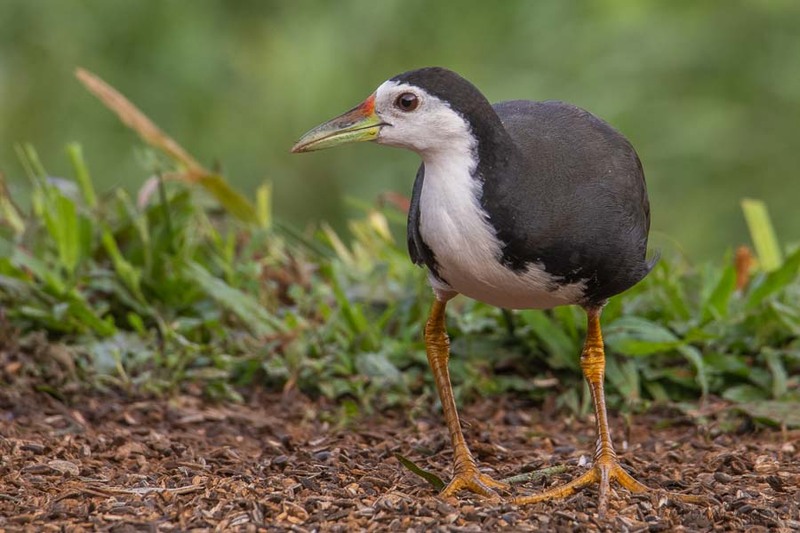 First one to enter on the scene was the white-breasted waterhen, it lingered on for few seconds very cautiously. 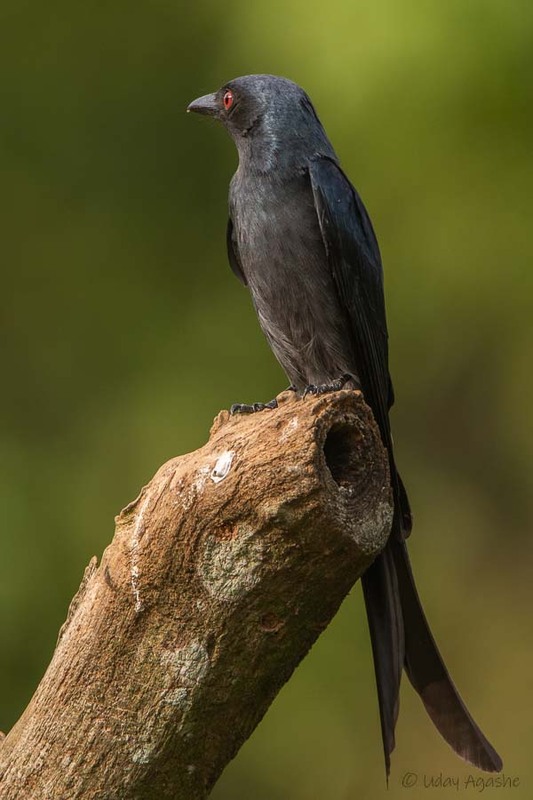 Then came the racket-tailed drongo, quickly followed by the woodpeckers and white-cheeked barbet. All of them were quickly moving from perch to perch and it was fascinating to watch their movement from such a short distance. There were quick movements, small fights for the right perch, and lot of noise. In all this drama, the white-throated kingfisher kept on speeding in, and before we even readied our cameras it used to dash away at super-fast speed. It kept doing that multiple times. 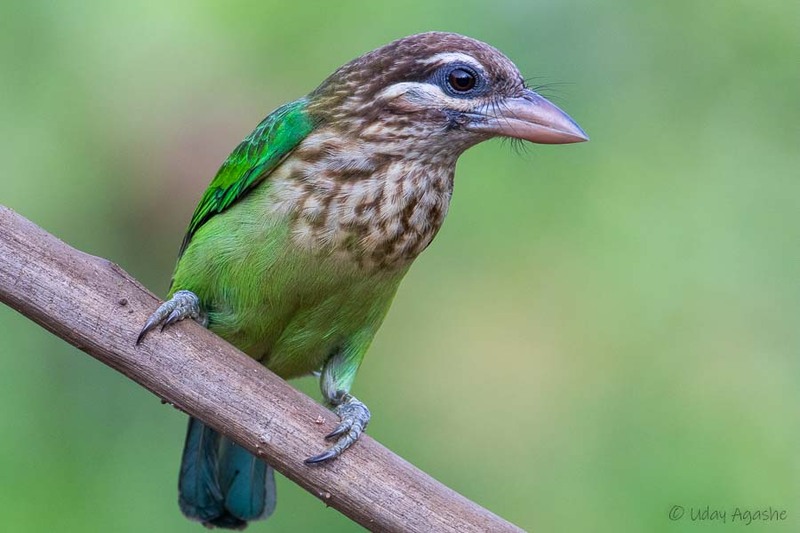 After sometime the barbet kind of became steady and was also seating on the closest perch. This allowed us to take some very good images. The morning session was also attended by the stray Malabar Parakeet and Southern Coucal. From 7am to 8am, we were kept busy by this hectic bird activity. We would have liked to continue but then Eldhose asked us to get moving for breakfast (had to again go back to our resort). His plan normally includes forest birding till afternoon but since we had already done that for the first 2 days (with a different bird-guide), we asked him to allow us another hide session. 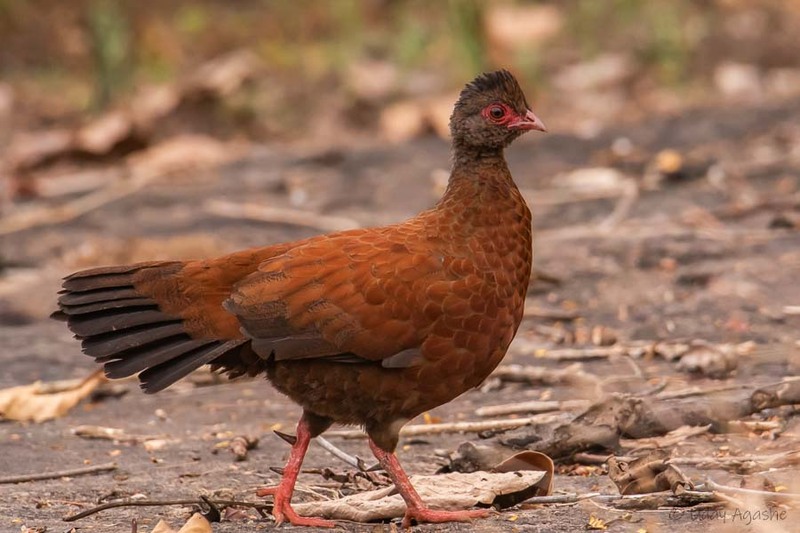 And so we were back at the hide by 10am, once again we were greeted by the Waterhen. Few red-whiskered bulbuls followed. The next 2 hours were largely dominated by the Brown Shrike, it kept on giving us various poses on different perches in all possible lighting conditions. It is fascinating to watch the styles of different bird species on the hide. 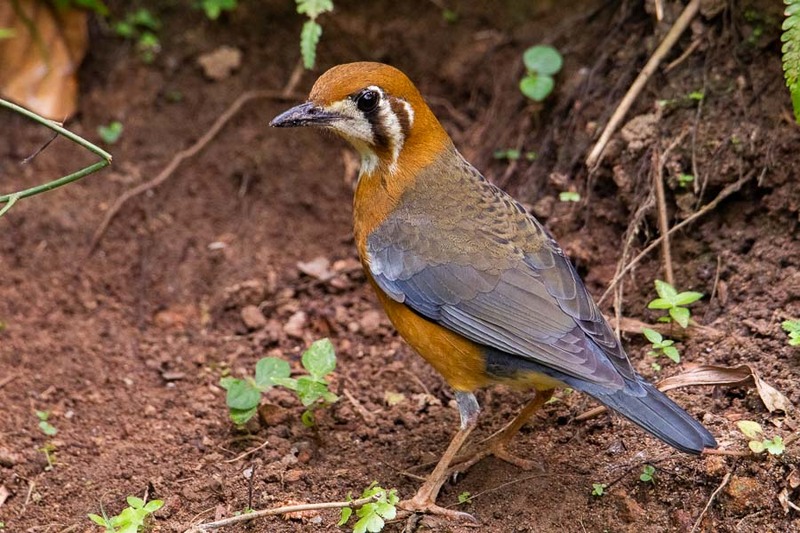 The Rufous Tree-pies are large birds, so they just terrorize other smaller birds and always take the prime perches. 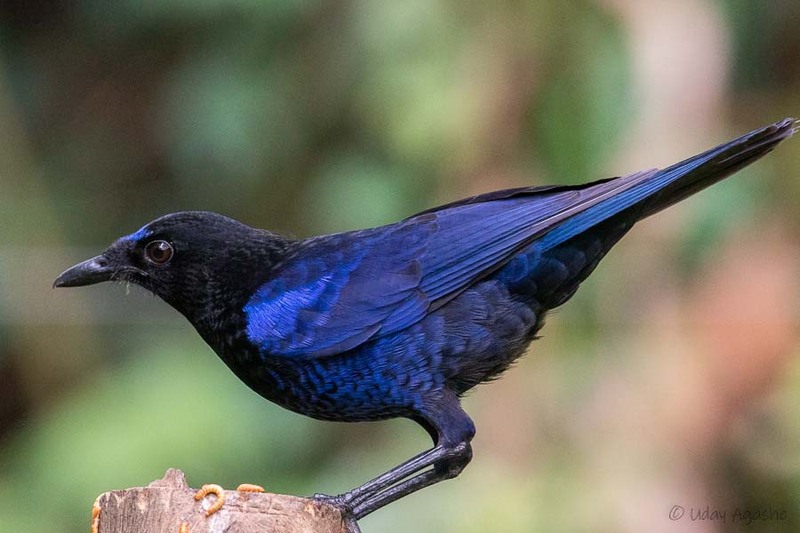 Even the Drongos are aggressive and at times fighting with each other for space. 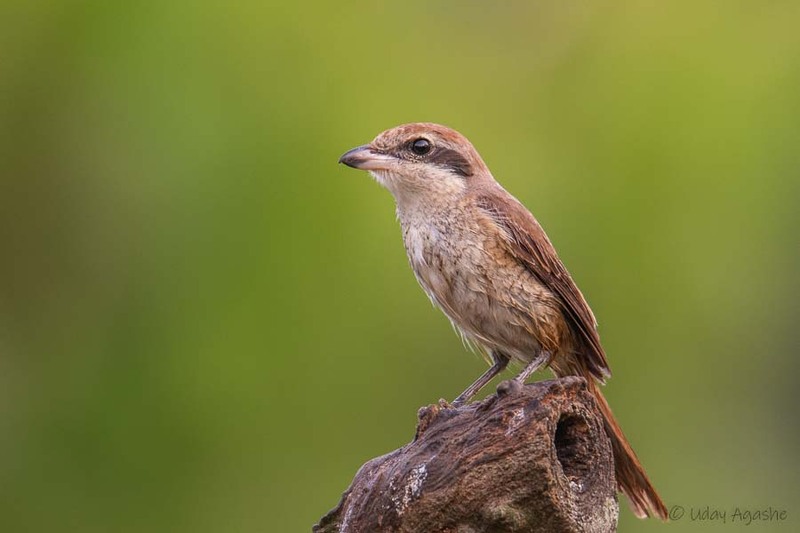 The Shrike was comparatively cautious and kept moving away with every other bird coming in. 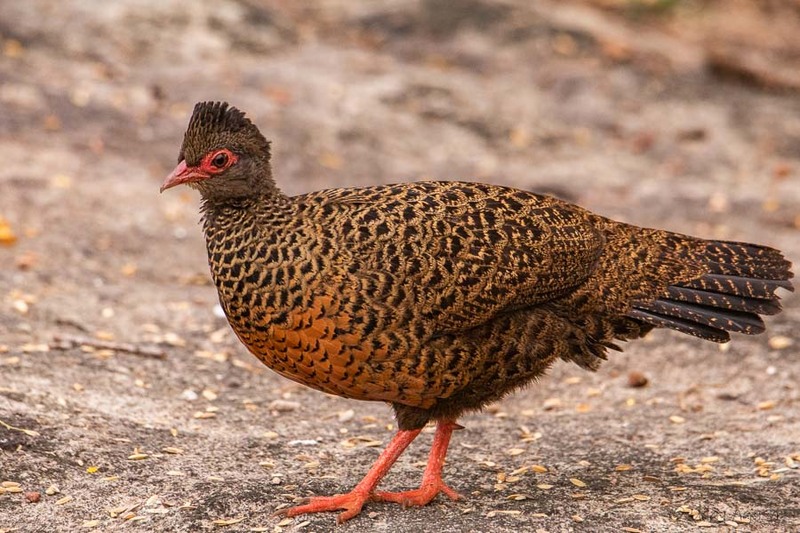 But the most frightened was the water hen. It was always on tenterhooks, even a smallest movement or noise would make it jump on its place. In the second session the activity was definitely very less and by about 11:30 we decided to move back to our resort. This time Eldhose had provided us with auto-rickshaw for the journey. It’s little bigger in size than those we see in Maharashtra and had some space at the back. We kept our tripods and bags there. And while coming out, I forgot to take my tripod. Didn’t even realize till our afternoon session. 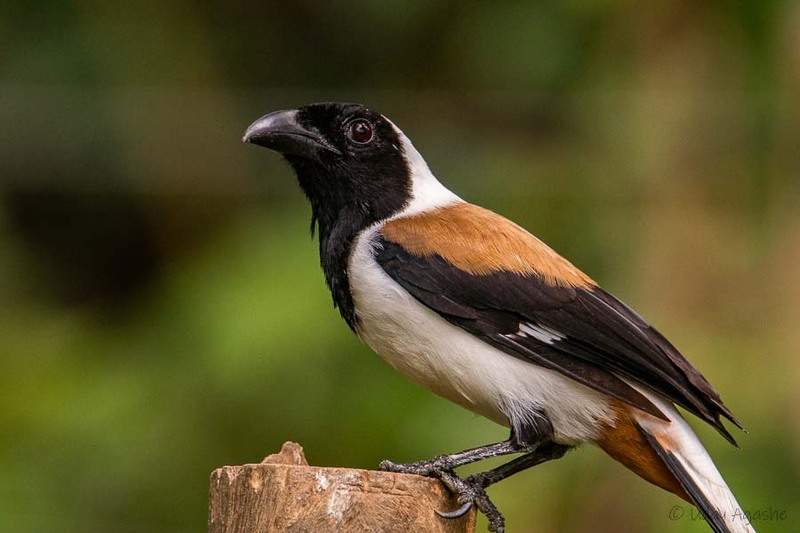 During our earlier discussions, Abhay (and Mr. P) had made us aware of one special hide where we could see “White-bellied Treepie” and some other flycatcher specialties (we termed it as “Flycatcher hide”). We were hoping to make it there in the afternoon. Our vehicle came to pick us up and 1:30 but the other group was little delayed (they came a little late from their forest birding round). Finally we started by 2, and to our surprise the driver dropped us to another hide which was already full with other birders. There was no way we could have all fitted in that hide. So only Mr.S and Mr.P went inside with Abhay and myself standing outside. By then I had realized about the missing tripod, luckily the driver was very helpful and he made a trip to the village and fetched the tripod from the auto. In the meanwhile Abhay contacted Eldose and explained him the problem, but unfortunately he had no answer. He then suggested to go back to the same hide that we occupied in the morning. We had no choice but to accept it. Effectively all 3 sessions that day we had to use the same hide (which typically implies same set of birds, although with little different lighting conditions). 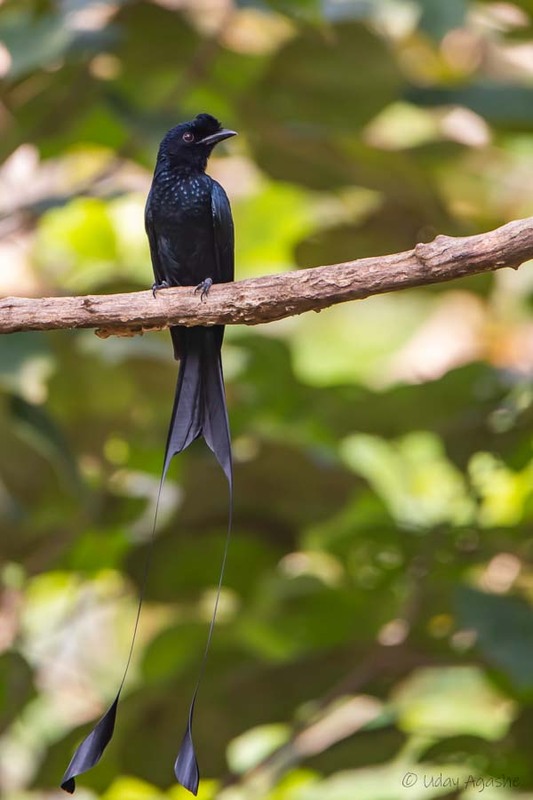 But before we departed from that hide, I had a chance to click “Oriental Magpie Robin”, “Indian Paradise Flycatcher” and some “Blyth’s starlings” (had to take handheld shots as I didn’t have my tripod). This hide was empty and we made ourselves comfortable there. We all were prepared to be happy with whatever that we get to see and thus it became an enjoyable experience. We were greeted immediately by the starlings, drongos, common mynas and the rufous treepies. 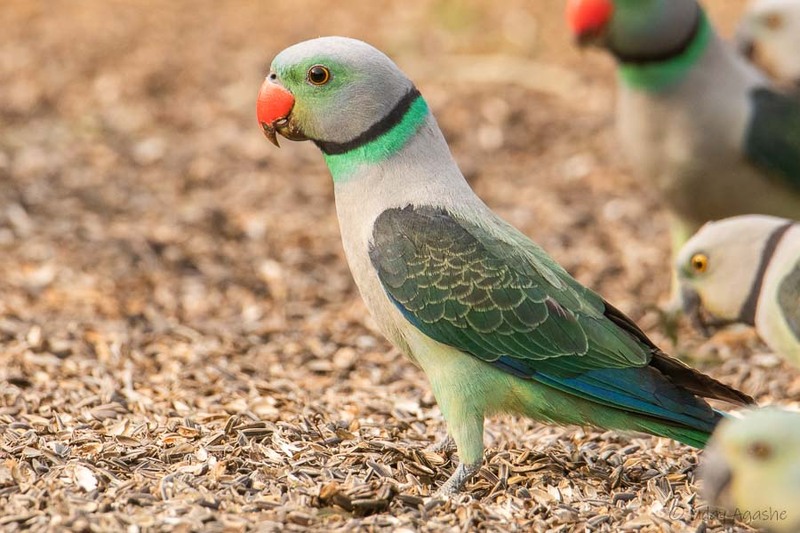 But the star attraction for that session turned out to be the huge flock of Malabar Parakeets. There behavior was very peculiar throughout that evening. We could hear some flutter and quickly the group would start coming in the field, some of the birds preferred to first occupy the perch and then gradually come to the ground. The males mostly did that. They would merrily keep feeding for a minute or two and suddenly within few seconds, all of them will fly away (all of them flew in same direction always, as if there was someone guiding there movements). This continued thru the session, and it was fun to watch. Besides photos I also took a few videos. 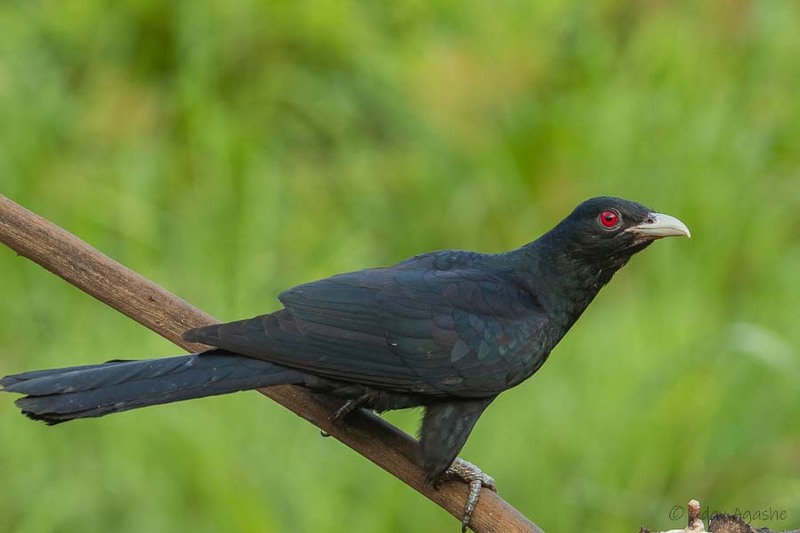 During that session, we could also see a pair of Ashy Drongos perching for some time and there were 2 rose-ringed parakeets (we came to know that this was their first record on that hide after long). All-in-all, we had very good time there. As the light started reducing, we decided to move back to our rooms and rest for the day. Once again, I had alarm for 5am and the coffee was ready at 5:30. But by the time our vehicle came and we started for the hide, it was 6:45am. Once again we made our journey near to Eldhose’s house but this time we stopped little before his place and went instead near a patch of barren land (rocky patch with some sporadic scrubs). I was little confused as to why we stopped there but Mr. P cleared my doubt. He had actually showed us this area yesterday and mentioned about possible sighting of Jungle-fowls there, we were waiting for the fowls. And the moment we settled inside the tempo-traveler with our tripods and cameras, the red spurfowls quickly appeared on the scene. They were looking superb in that morning light. Besides them, we had some squirrels and magpie-robins for the company. 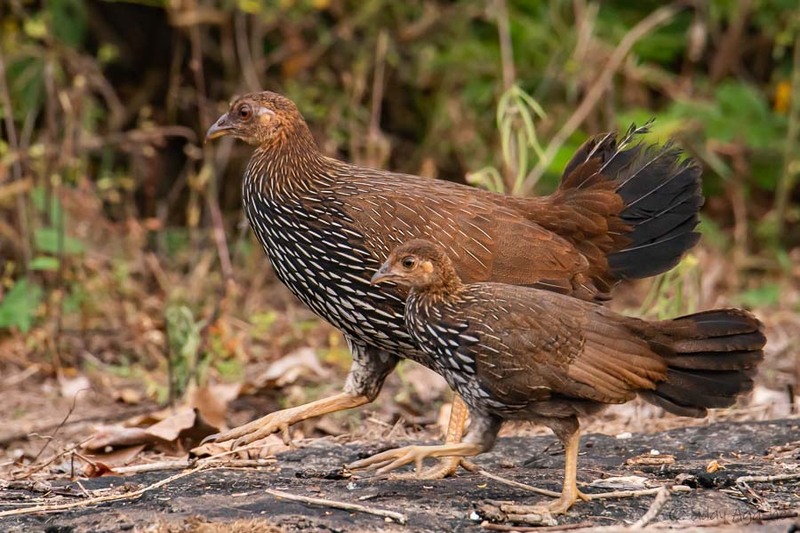 Within 10 minutes, we got to see the majestic “Grey Junglefowls”. 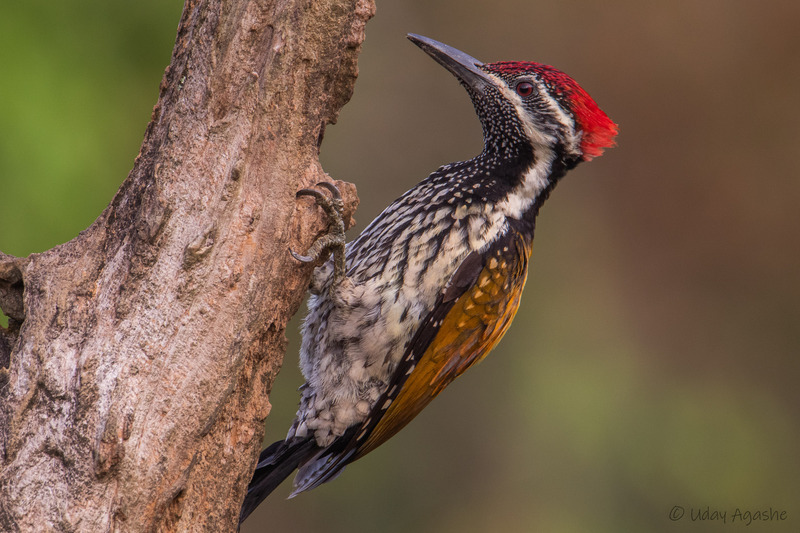 The male specially was looking so colorful. For a moment I forgot about taking photos but quickly got back to that task. This entire show lasted for about 45-50 minutes and Eldhose arrived on the scene taking us back to his house. 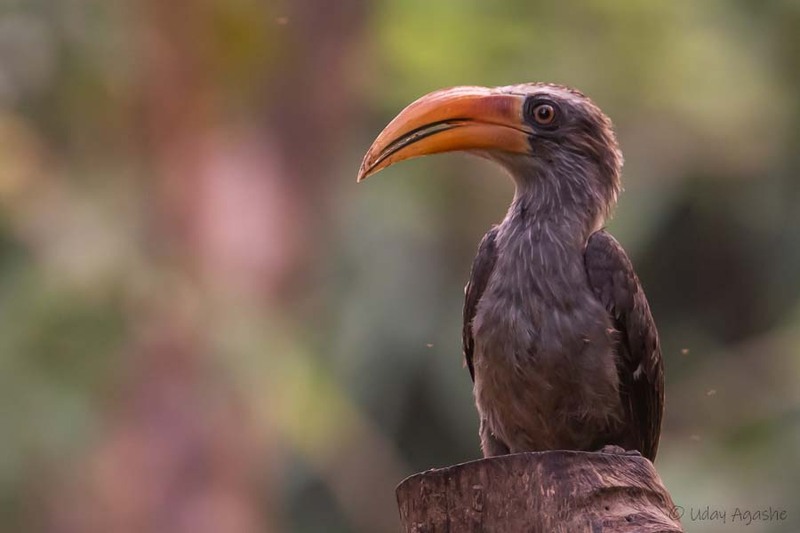 Normally after this, the other birders were scheduled for Forest-walks but since we had opted out of that, he allowed us to wait outside his house for another session with the hornbills. Today since we came little late (that yesterday) the light was better. We spent about an hour there and decided to head back to our resort. Our next session was after lunch (at 1:30pm) and based on yesterday’s experience, Abhay was behind Eldhose to give us priority in assigning the hide. We just hoped to get to the “Flycatcher hide” as this was our last chance. And Eldhose did not disappoint us. We drove (and then walked considerable distance) to that elusive hide finally. We had lot of expectations although the light was very low, the hide was under heavy canopy blocking the sunlight. Abhay instructed us to increase the ISO considerably (all thru the session the minimum was 800 and max ISO was 2000). And the experience here was superlative. 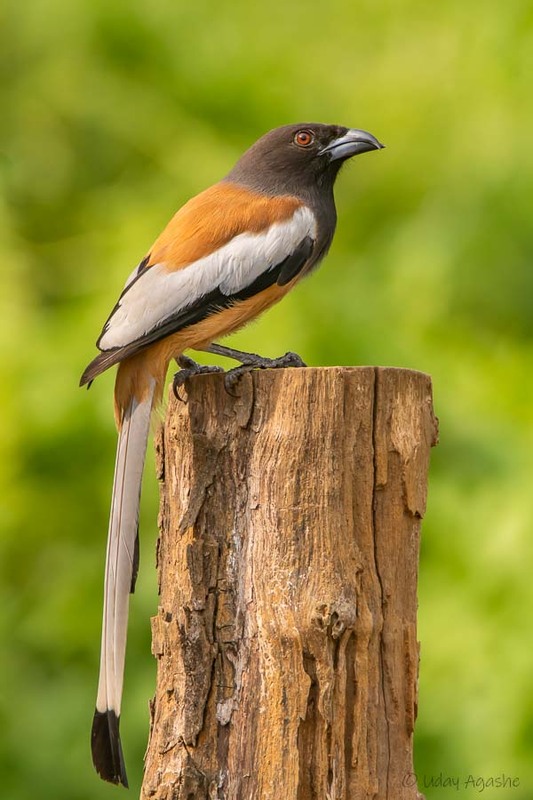 Within 5 minutes we had the pleasure of seeing the “White-bellied Treepie”. It was quickly followed by “Indian Blackbird”, and “Blyth’s starlings”. 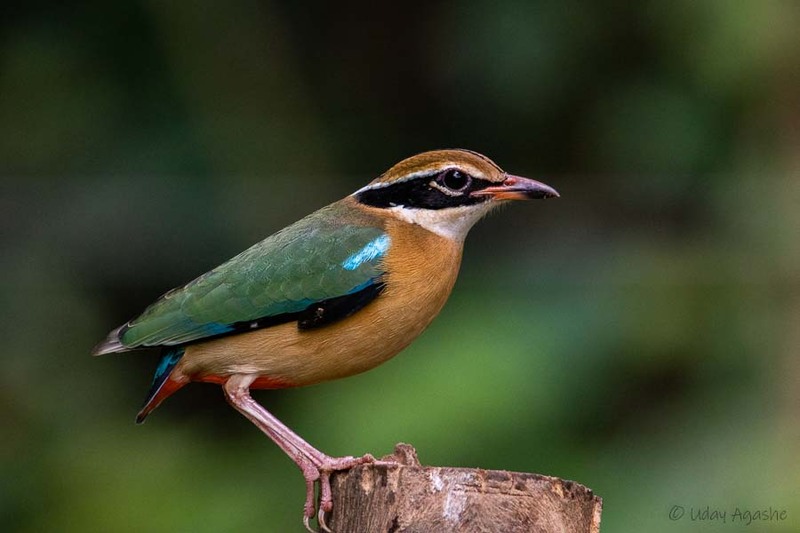 Then came the “Ground Thrush”; we had just clicked few images of it and were alerted by Abhay (a whispering shout – difficult to imagine how a shout can be a whisper but you have to experience it in a birding hide only) about the presence of the beautiful “Indian Pitta”. It was initially hiding behind the small bushes but soon appeared on the perches. The clicks then were relentless. Within those 15-20 minutes, there were many other species (some lifers too) making their appearances, I just lost count of who many (no point mentioning it here, please see the pictures instead). Very soon we were joined by 5-6 other birders in the hide (it was chock-a-block inside the narrow hide) but no one was complaining as the birds continued to rain-in with amazing consistency. From around 1:45pm till close to 4:30pm, we had lost track of time (I can now mention the times only because the photos have timestamps). But we had a flight to catch and the light was fading quickly. We decided to call it a day then and headed back to our vehicles. We started out return journey from resort by 6:30pm, quick dinner on the way and by 8pm we were at the Cochin airport. These 4 days were exhausting physically but we were all super happy with the sightings. Abhay as usual was a bundle of energy even then and insisted on a selfie at the Airport.